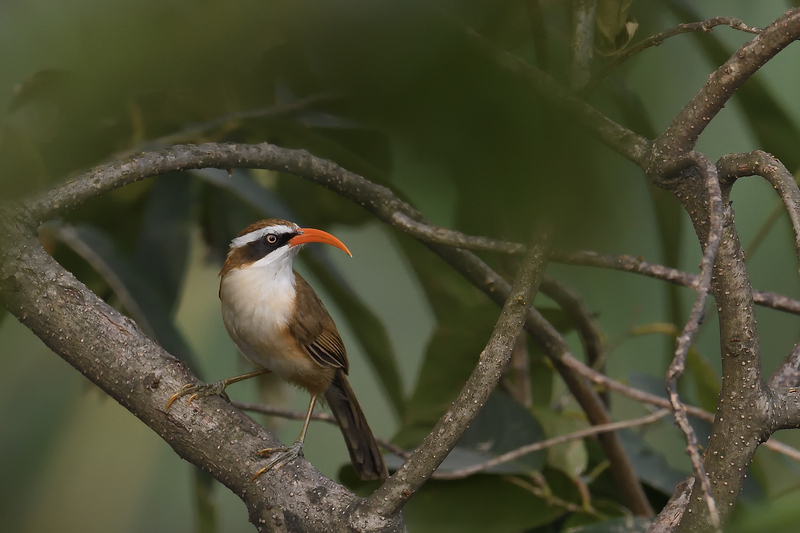 The Red-billed Scimitar Babbler is the 550th in my collection. I reached this milestone early on the trip to Mishmi Hills. This was early in the morning, must have been around 6:30 am, though in that part of the country it was technically mid-morning and the sun was making its way over the mountains. As an aside, I didn’t really think about the fact that the name of the state , Arunachal Pradesh, literally meant “Land of the Dawn-lit Mountains” till a book was pointed out to me later in the trip. We had stopped for a while, were scanning the valley below and had spotted a few species – most of them so far away that they might as well have been in Timbucktu (would have been a few pixels, at the most, in our frame). I was hardly clicking anything at that point when, suddenly, we realised that we had an interesting visitor quite close by. Very fidgety with a hollow, piping whistle and a striking red-bill that contrasted with the rest of the body. There were two of them but it was quite a task getting locked on either one of them as they kept flitting from branch to branch and shrub to shrub at quite a rapid pace. On top of it, I was obscured by the shrubs and had to shoot through leaves – which does provide an interesting frame for the subject though. It felt good to have an interesting bird to round off a milestone.